Each state and territory elects multiple Senators using a preferential voting system. Each state has twelve Senate positions with six year terms and each territory has two Senate positions with three year terms. At a federal election only half of the Senate positions for each state typically become vacant, resulting in six Senate vacancies per state, while all territory Senate positions become vacant. The order of the party columns on the ballot paper for each state and territory is determined by a random draw held immediately after the declaration of nominations. 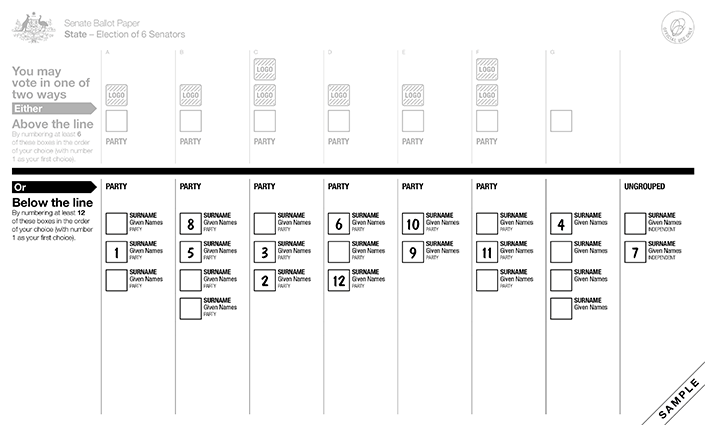 Some columns on the Senate ballot paper will feature a party logo but some will likely not. This is dependent on each party officially registering a logo with the AEC. 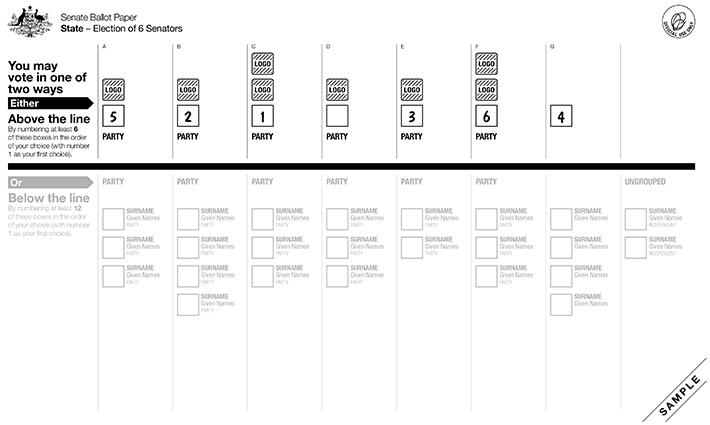 Senate ballot papers are white in colour. If you vote above the line, you need to number at least six boxes from 1 to 6. Place a 1 in the box above the party or group that is your first choice, the number 2 in the box above the party or group that is your second choice and so on until you have numbered at least six boxes above the line. You can continue to place numbers in the order of your choice in as many boxes above the line as you like. If you vote below the line, you need to number at least 12 boxes from 1 to 12.